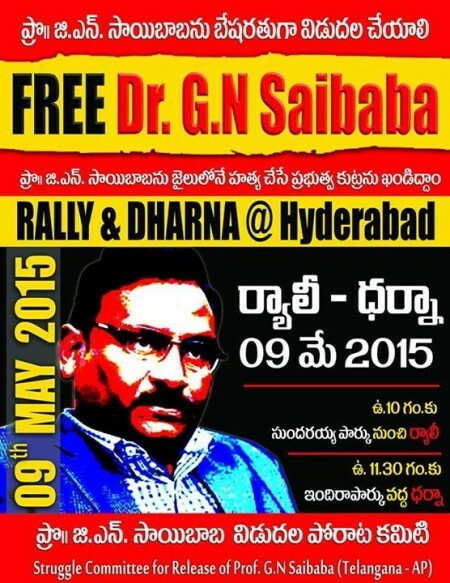 Demonstration for Immediate Release of Dr GN Saibaba on 9th May @ Hyderabad. It will be one year on 9th May 2015 of continued incarceration of our colleague Dr. G.N. Saibaba. He languishes in jail without trial and without bail while his health is deteriorating fast. 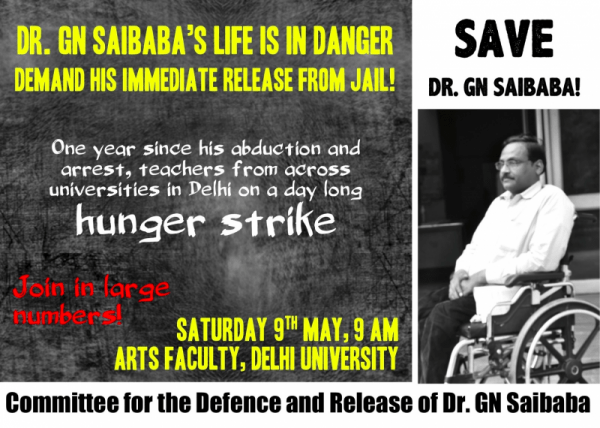 Please come and participate in the day-long hunger strike to save life of Dr. GN Saibaba and secure his early release from the solitary confinement in Nagpur Central Jail. Please circulate this message among your friends and encourage them to come and participate. Teachers and representatives of Teachers’ Associations from JNU, IP University, JMI, and Ambedkar University are joining the hunger strike.